Here’s a look at the biggest outdoor party in outer East Portland: This year’s Montavilla Street Fair …. Downtown Montavilla again becomes the location for summer’s coolest party, even on a tosty summer’s day. Starting with an idea to highlight the renaissance of Downtown Montavilla back in 2011, over the years the Montavilla Street Fair has grown to be the most exciting street festival in outer East Portland. 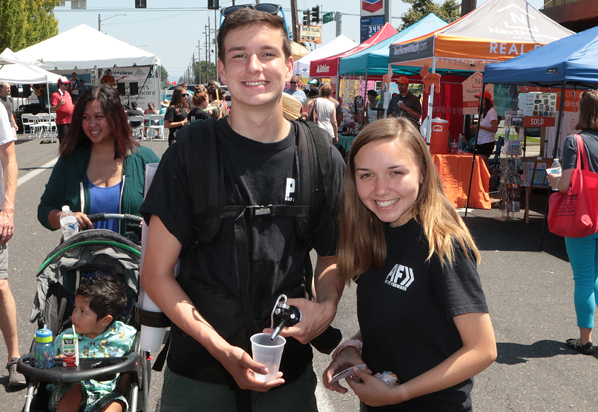 >> Read about the very first Montavilla Street Fair: CLICK HERE. 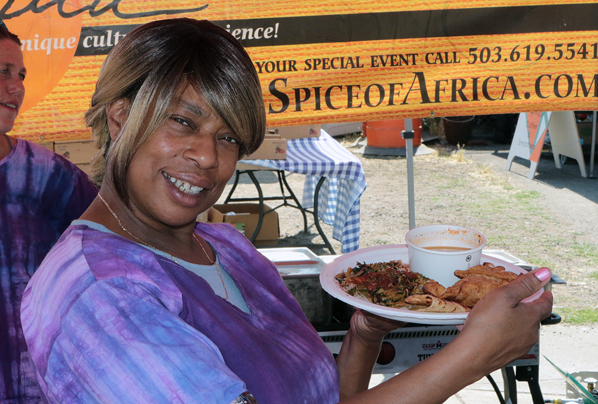 Janice Currie from Spice of Africa tempts passers-by with her delicious and savory dishes. It’s amazing what a band of dedicated volunteers can do with the help of the community: It can produce a community event that attracts an estimated 15,000 people – even on the steamy summer’s day of July 29. From 10:00 a.m. until 5:00 p.m., SE Stark Street, between 76th and 82nd avenues was closed down and became the midway, featuring more than 180 vendors. Welcoming people to the business district, at its booth, is the Montavilla East Tabor Business Association President, Tina Granzo. 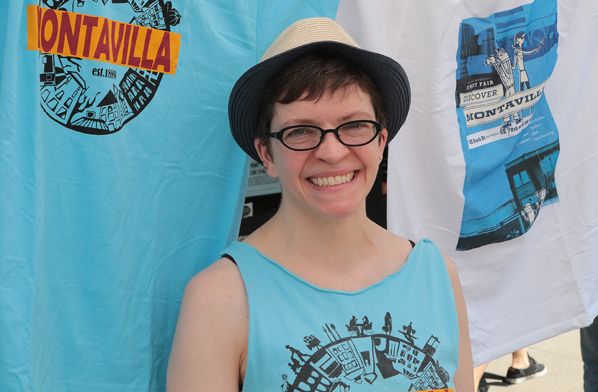 “This, 7th annual street fair, is our biggest fair to date,” grinned Montavilla East Tabor Business Association (METBA) President Tina Granzo who is also associated with City Beautiful Design Web Development. 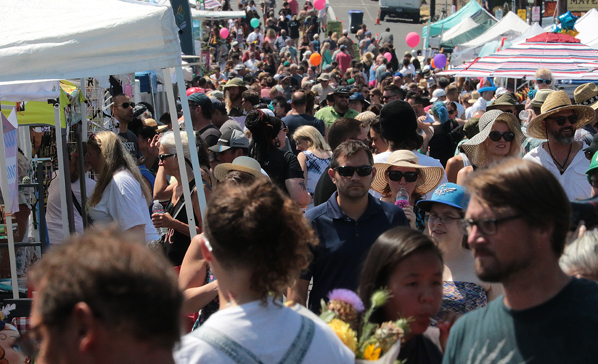 “It’s amazing and fulfilling to see the number of people out here today, braving the heat, visiting our vendors, and checking in with our retailers, here in our own neighborhood business district,” Granzo said to East Portland News. 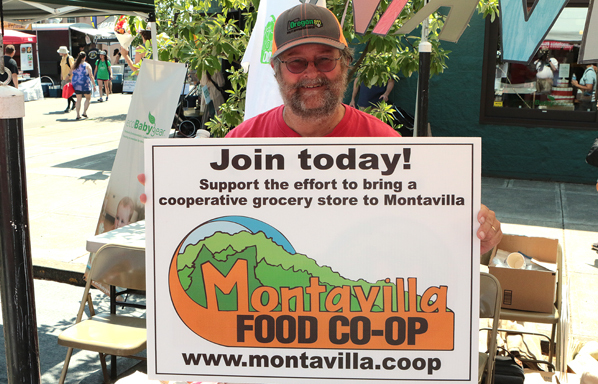 Montavilla Food Co-op “Sign Man” Bill Glenn says he enjoys encouraging folks to become member-owners. “How about a free cup of ice-cold lemonade?” asks Joseph Ramirez, and Jezenia Martinez, volunteers with Pay It Forward Portland an outreach of Mission Church. 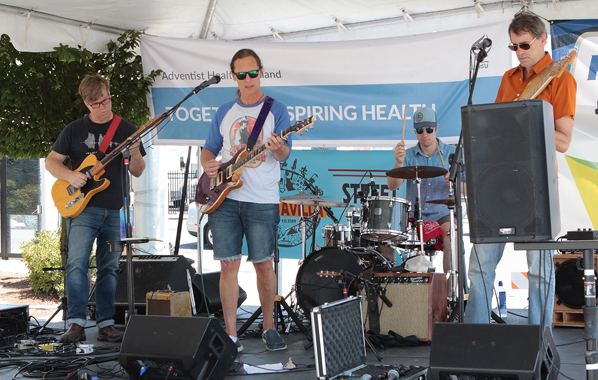 “We think people came out, on of one of the hottest days of the year, because this is such a cool family-friendly event; it’s free, you can come, hang out, listen to music on one of our stages, and have a good time,” Granzo remarked. This band, “The Yellers” (“We’re too young to be ‘Old yellers’” their front man says), plays an eclectic lineup of popular tunes. 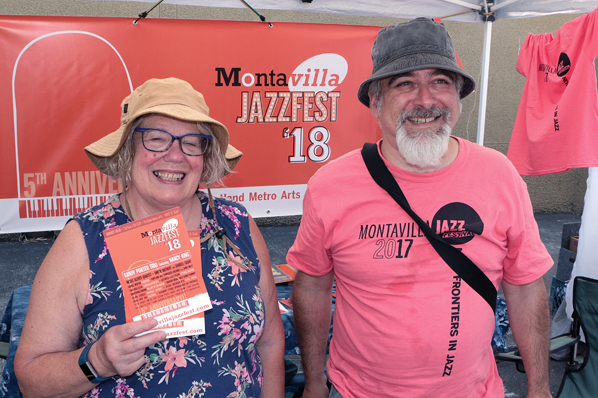 Speaking of music, promoting the Montavilla Jazz Festival are volunteers Sharon White and Aaron Hayman. 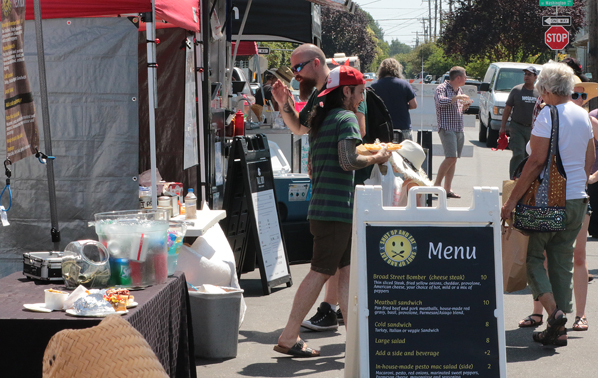 In addition to Montavilla shops and restaurants, fairgoers browsed among vendors selling food and drink, art, handcrafts, clothing, as well as marketing local products and services. And, as in previous years, the Montavilla Farmers Market was open extended hours. With great restaurants in Montavilla, and a street full of food carts, no one goes hungry at this street fair. Throughout the year, Granzo commented, some 50 volunteers work on the event, in one way or another, and more than 25 volunteers pitch in on the day of the fair to help coordinate set up, and keep it all tidy. 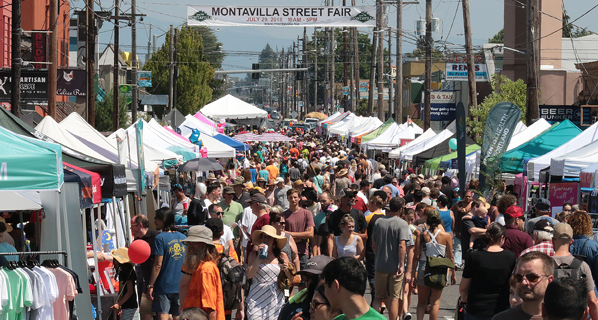 Throughout the day, thousands of people come and enjoy this year’s Montavilla Street Fair. Learn more about METBA at their official website: CLICK HERE.